in English. Kidd prasied her simple English poem and encouraged her to go on writing, which was the beginning of her lifelong ‘experiment’ of writing poetry solely in her adopted tongue, English, though she has never lived outside of Japan. In 1970 some of her friends raised fund and set up The Ikuta Press to bring out a book of her poems, trilogy. In 1972 Lindley Williams Hubbell, Hisao Kanaseki and Danno, each inviting another contributor, started the annual, or biennial collection of poems, Anthology, which lasted until 1991. Yoko has chosen to write poetry in English rather than Japanese. She has been doing this for more than 20 years. It is not that she has lived a long time out of Japan. Although she herself might not say so, I think that her choice of English is part of strategy toward the solution of contemporary dichotomies and unearthing of the deepest roots. If she wrote these poems in Japanese she would run the risk of sounding precious or archaic. The bluntness of English is an excellent foil for her subtleties. due to the financial tightness of the press. • New Two Poems: Further Center: Poems 1970 - 1998 was published by the IKUTA PRESS, October, 2017. •Yoko's 'Two Poems' was posted in Asian Cha Journal. • Woman in a Blue Robe by Yoko Danno was published by Isobar Press. • Review of "Woman in a Blue Robe" by Ian Brinton on The Tears in the Wall. • Aquamarine by Yoko Danno is reviewed by Nettie Farris in BLUE LYRA REVIEW: A Literary Journal of Diverse Voices . • Some of Yoko's poems were posted in TRUCK:The World Is Not Enough, edited/driven by Jane Joritz-Nakagawa, December 2015. •"Interview" of Yoko (along with her ten poems) by Tatjana Debeljack was posted in the Serbian magazine "DIOGEN" for culture, art, science and education. 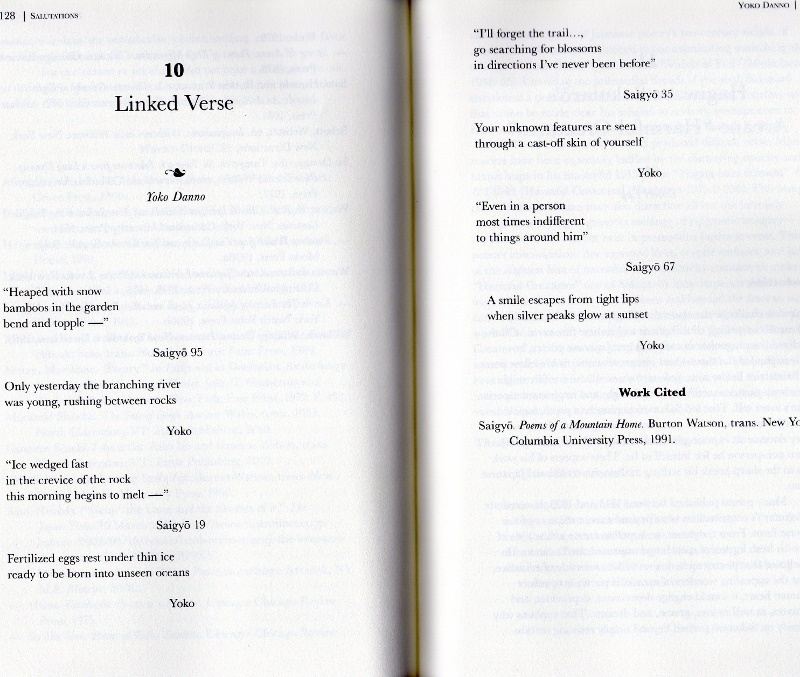 • Yoko contributed her Linked Verse with the poet/monk Saigyo (1118 - 1190) to "Salutations; a Festschrift for Burton Watson" edited by Jesse Glass and Philip F. Williams. •Yoko'a poem METAMORPHOSIS was posted in METAMORPHOSIS Series by Silver Birch Press. •Yoko's poem SNOW ADVENTURE was featured in MY PERFECT VACATION Series by Silver Birch Press. •Yoko's poem GERMINATION was featured in ALL ABOUT MY NAME Poetry Series by Silver Birch Press. • The revised edition of "Songs and Stories of the Kojiki" retold by Yoko Danno was published by Red Moon Press (August 2014). • Yoko's new prose poem "Dream of a Butterfly" is published in a glimpse of #16.
was published in a glimpse of #14. • Yoko's prose poem In Pursuit of a Bird was published in a glimpse of #13, 2013. • Yoko's poems are included in the Asian Edition of Poetry Magazine.com, spring 2014. • A new collection of her recent poems, Aquamarine is published, January, 2014 by Glass Lyre Press, LLC. • DVD of "Collaborative Poetry in Image and Sound: Poetry Globe. Colours" at St. Perter's Church in Riga, where James C. Hopkins and Yoko Danno read their collaborative work, "sleeping tiger dreams of riga, was produced by apostrofs (Riga, 2013). •The Latvian version of "a sleeping tiger dreams of manhattana" (Ikutapress, 2008) was published by Mansards Publishing House, Latvia (September, 2012) and the co-authors, Danno and James C. Hopkins, were invited to the book-launching event and also to Poetry Days of Latvia (October 9 - 12, 2012). Re-published in Epitaph for memories, The Bunny and The Crocodile Press, Washington, DC, 2002.
by Mansards Publishing House, Latvia, in September 2012. Reviewed by Nettie Farris in BLUE LYRA REVIEW: A Literary Journal of Diverse Voices . • Woman in a Blue Robe , Isobar Press, September 2016 Review of "Woman in a Blue Robe" by Ian Brinton on The Tears in the Wall.